Pansit in any form (bihon, canton, palabok, luglug or habhab) is traditionally served during birthdays or any celebration in the Philippines. Pansit bihon is made with vermicelli noodles. Pansit palabok is made with rice noodles and served with sauce that is flavored with shrimp and smoked fish. Pansit luglug is similar to pansit palabok. It is usually served with more sauce and seafood toppings. Pansit luglug is made with miki or Shanghai style noodles and is served using banana leaf. Pansit canton is made with egg noodles. Heat oil in a pan over medium high heat. Saute garlic and onion for about 5 minutes. Add chicken or pork. Saute until the meat turns brown. Add the chorizo and shrimp. Saute until the shrimp turns pink. Season with soy sauce, oyster sauce, salt and pepper. Add all the vegetables except for parsley. Cook until the vegetables are still crisp about 8-10 minutes. Take the meat and vegetables out of the pan. Pour in the chicken stock and bring to a boil. Put in the noodles and cook until most of the liquid is absorbed stirting constantly. Put the meat and vegetables back in to the pan and mix with the noodles. Garnish with sliced calamansi, lemon or lime. Serve hot. 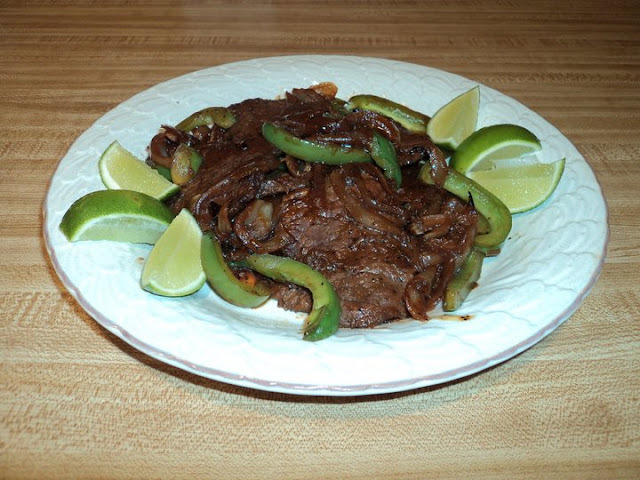 Bistek Tagalog is a Philippine version of the western beef steak. The dish is made of pan-fried marinated thinly-cut steak which is simmered afterwards in the soy-calamansi marinade. The word bistek is a Tagalog slang for beef steak. Bistek itself is a method of cooking. The meat used is not only limited to beef. Pork is also used as well as bangus or milkfish. Heat oil in a pan over medium high heat. Stir fry the onion rings. Set aside. Pan-fry the meat until brown in the same oil setting aside the marinade. Remove the meat from the pan. Pour in the marinade and bring to a boil. Lower heat and simmer until the sauce thickens to the desired consistency. Return the meat to the pan and simmer for 10-15 minutes. Aside from beef, pork and milkfish can be used. The marinade* can also include the onion rings, but most people don't like the strong smell of raw onion. Arroz Caldo is one of the most popular comfort food in the Philippines. It is a chicken and rice porridge flavored with ginger, garlic, onion and fish sauce. It is similar to a congee. The dish has Chinese origins but the Spaniards gave it the name arroz caldo which means hot rice. Other related dishes to arroz caldo are goto and lugaw. Goto uses tripe, gizzard and/or chicken blood instead of chicken meat while lugaw is just plain congee. Arroz caldo along with goto and other noodle soups are popular entrees at carenderias (local eatery where customers choose from a selection of cooked meals from a counter, pay and bring their food to their table) and tapsilogan (breakfast places usually open whole day) in the Philippines. I think arroz caldo's appeal goes above and beyond. I remember when I took my husband (boyfriend then) to his first arroz caldo experience in the Philippines. It was a rainy evening and he wasn't feeling well then. I told him mothers in the Philippines usually serve rice porridge to a family member when the latter is ill. I wasn't surprised that he loved the arroz caldo! I remember asking for more toasted garlic for our arroz caldo bowls. Heat the oil in a pan over medium high heat and saute the garlic, onion and ginger. Add the chicken and lightly sprinkle with a pinch of salt and pepper. Season with fish sauce and continue cooking until meat is lightly browned. Add the sticky rice and stir until lightly browned. Don't burn the rice grains! Pour in water. Bring to a boil and simmer for 30-45 minutes stirring occasionally to prevent rice grains from sticking at the bottom of the pan. Adjust seasonings (fish sauce, salt and pepper) to taste. Add saffron. Serve in a bowl and garnish with hard-boiled egg, toasred garlic, spring onion and calamansi/lemon. Heat 1/3 cup of oil in a pan over low heat. Add 1/2 cup of minced garlic. Adjust the heat making sure that the garlic is not burning. The secret here is to slowly toast the garlic in oil over low heat. When the garlic is golden brown, drain and spread on a plate lined with paper towel to absorb excess oil. Leftover chicken adobo can also be used in arroz caldo. 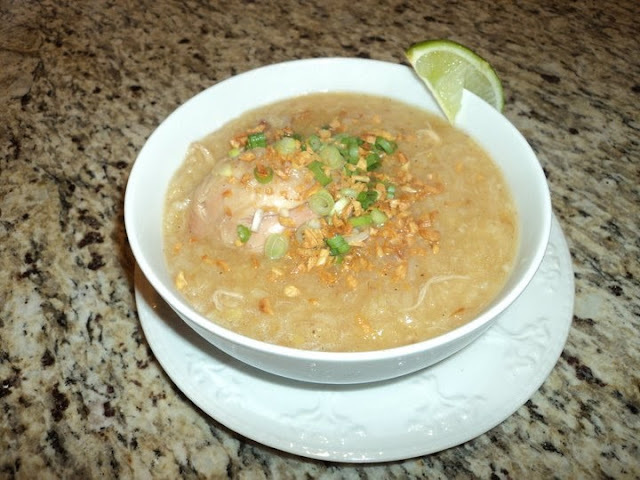 For a leaner arroz caldo, use boneless and skinless chicken breast. A half and half mixture of sticky rice and regular grain rice can also be used. Instead of topping the arroz caldo with hard-boiled egg, chicharon or pork cracklings can also be used for a richer taste. Arroz caldo is usually served with tokwa't baboy (fried tofu and pork slices) on the side. Leche flan or creme caramel is the queen of all desserts in the Philippines. It is a decadent smooth custard made from eggyolk and milk and topped with soft caramel. The difference between leche flan and creme brulee is the consistency of the caramel, the latter has a toasted caramel top. The recipe that I will share is from my Aunt Lovina, my mom's elder sister. 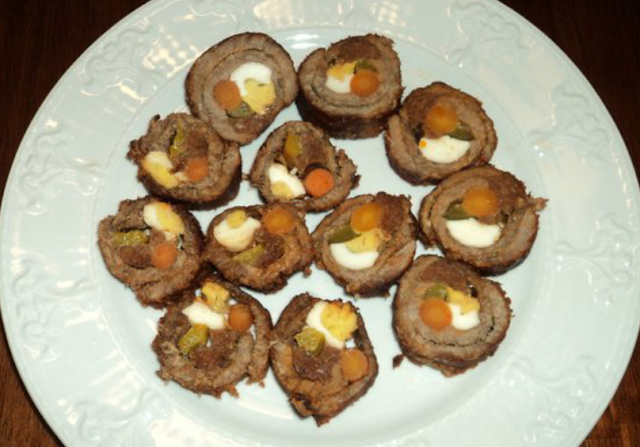 I believe this is the recipe that was passed on from my great grandmother to my grandmother. I think Aunt Lovina makes the best leche flan! Beat the egg yolk in a mixing bowl using a hand mixer or electric beater. Mix in the condensed milk, evaporated milk and vanilla extract thoroughly. Set the mixture aside. Heat the llanera or tin or aluminum mold over low heat. Spread the sugar on the mold. When the sugar has caramelized or has turned light brown in color, remove from heat and set aside for about 5 minutes. Pour the custard mixture in the mold and cover with tin foil. Steam for about 30 minutes. Insert a knife into the middle part to check for doneness. If it comes out clean, the custard is cooked. Coffee or rhum can be added to the caramel for a more interesting flavor. Vanilla can also be substituted with lemon extract. Pansit palabok is my favorite noodle dish in the Philippines. I would say it is the queen of all pansit or noodle dishes. 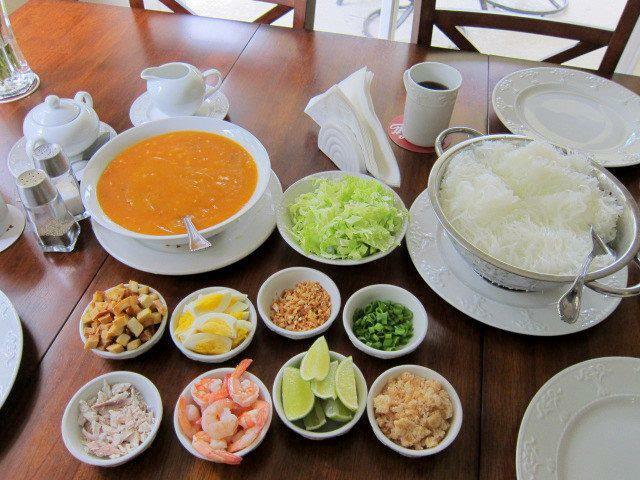 It is made of vermicelli noodles that are either boiled or soaked in hot water and topped with annatto sauce flavored with shrimp, smoked fish and other seasonings. The toppings range from shredded smoked fish, pork cracklings or chicharon, hard-boiled eggs, fried tofu and vegetables. Just like any other noodle dish, the secret to a great pansit palabok is the sauce. I learned making the sauce from scratch from my mom. 1 lb. 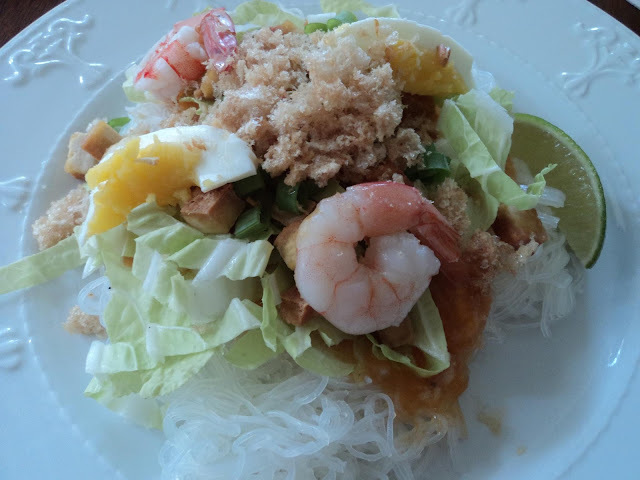 vermicelli noodles (soaked in hot water for 15-20 minutes or until tender but not soggy) If using the thicker palabok noodles, follow instructions on package. Heat oil over medium high heat. Saute garlic, onion and shrimp for 5-7 minutes. Add broth and season with salt and water. Bring to a boil and simmer for 15 minutes. Combine juice from soaked and drained annatto seeds with shrimp broth in a sauce pan over medium high heat. Add flour and water mixture. Add tamarind juice and season with fish sauce/ salt and pepper. Bring to a boil and simmer for 8 minutes or until the sauce is thick.